How are Easy Signs custom printed vinyl stickers cut and supplied? With our standard cutting method we digitally die cut the stickers using a Kongsberg flatbed cutting table. This allows us to cut any size and shape quickly and cost effectively as we don’t have to create physical dies. We just set up the artwork file on the cutting table and it cuts all the stickers to size and shape. It also cuts all the way through the vinyl sticker and the backing paper so that the stickers are all cut individually. Now the stickers are all cut individually, how are they packed for delivery? We wrap all the stickers together and place them into a cardboard box to protect them from damage during delivery. When you are ready to use the stickers how do you get the vinyl sticker off the backing paper? You just pick up one edge of the vinyl sticker and peel it off the backing paper. You are now ready to stick it onto any flat smooth surface. This is another method we offer for cutting stickers - but this must be requested when ordering (otherwise the stickers will be individually die cut). With this method the stickers are again printed onto a large sheet. We then cut the stickers to shape but we only cut through the vinyl sticker and don’t cut the backing paper. This leaves all the printed and cut vinyl on a large sheet of backing paper. We then remove all the excess vinyl around the cut stickers so just the cut shape of the stickers is left on the large sheet of backing paper. Now we have sheets of stickers, how are they packed for delivery? We cut the large sheet of stickers down to size to fit into one of our cardboard boxes. The cardboard boxes will fit sheets up to 285mm x 245mm (small box) or 400mm x 305mm (large box) depending on the size of the stickers. They are now ready for delivery. When you receive the stickers and ready to use them you simply peel each sticker off the sheet of backing paper. Why would you want to request this alternate cutting method? If you will be applying the stickers one after the other this might be better for you - as you can peel them off the sheet of backing paper faster and you only have to handle the larger sheets instead of lots of small individually cut stickers. Also you might have stickers with different numbers and this method will save you having to sort through lots of individual stickers to find the right one. 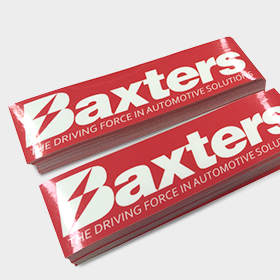 If you have any questions about our Custom Printed Vinyl Stickers please contact our friendly customer support team on 1300 972 077. 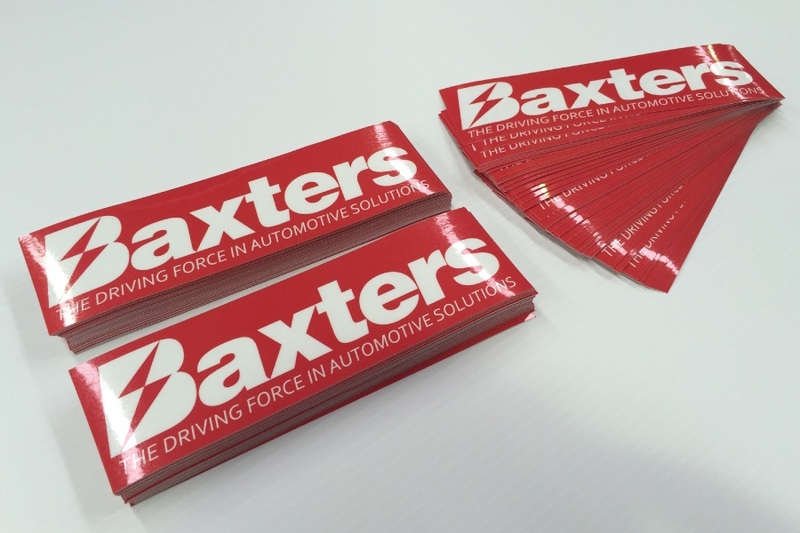 Custom Printed Vinyl Stickers are printed in full digital colour then die cut and supplied individually. These high quality vinyl stickers are water and UV resistant so are great for both indoor and outdoor use.